What’s the best way to get interested in Pre-War cars? As someone relatively new to the automotive industry and only being 24 years old myself, I have never really understood the world of Pre-War motor cars. I have admired the big Bentleys here at The Hub and lusted after the sleek lines of a 1932 Alfa 8C, but having never really driven such cars the fascination has been somewhat lost on me. To remedy this and to teach both Charlie and I (the young ones) a thing or two about Pre-War cars, the boss (Martin) instructed us to take the 1927 Bugatti Type 40 on a voyage down to Brooklands for a Vintage Sports Car Club Driving Test. The first thing to learn about a journey in a Pre-War car is that it in fact starts several days before you set off. There is a lot more to consider when taking a 92-year-old Bugatti out for a drive. 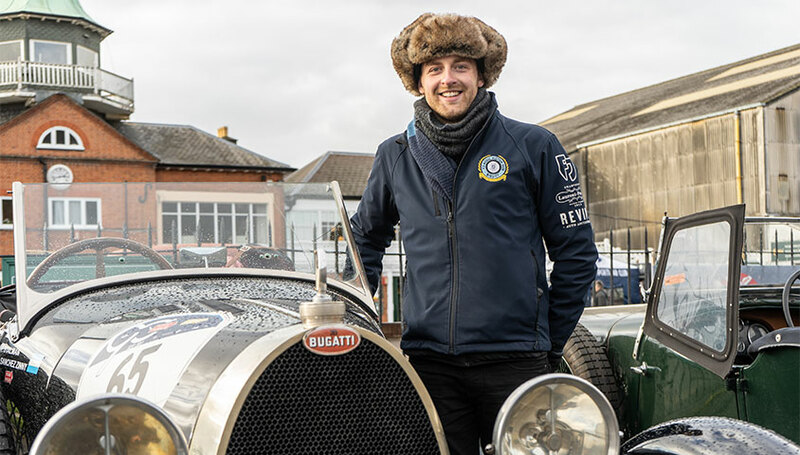 First of all, a lesson in double de-clutching is needed from historic racing hero, (and Hub workshop manager) Eddie Williams to make sure that the delicate Bugatti’s gearbox will have some teeth left on the cogs when we get back. Next you must pop to a car parts shop to get some lead fuel additive to cushion the nearly 100-year-old valves, then cobble together a basic tool-kit and finally search around for the special knock-off wheel tool after checking all the tyre pressures. After nearly a day’s setting up it is finally time to leave, as always going through the start-up routine. Check radiator water, oil level, open bonnet and make sure you know where the nearest fire extinguisher is. Then it’s time to tickle the carb and hold the choke on full while giving a little throttle and pressing the starter motor. It has to be said that all this sounds a bit of a faff if you’re used to driving modern cars, or even cars from the 50s onwards. However, when you are about to drive such a special car it only serves to build the anticipation and add to the excitement. Sunday morning breaks clear and dry much to our relief – a 200-mile drive in the rain did not sound appealing no matter how much of a privilege it is to drive such a special car. On the narrow country lanes just outside of Oxford the Bugatti feels alive and very much at home, happily bouncing over the uneven country lanes. The original leaf-springs give good compliance and the lightweight nature of vintage Bugattis means the car rides over the bumps instead of trying to hide and suppress them with clever suspension damping. The Type 40 entrusted to us is a very special Bugatti. After a DVLA crackdown on imported vintage cars several years ago, all UK registered Bugattis were required to be inspected by the Bugatti Owners Club. Mark Morris of the club examined the car and found almost all of the numbered mechanical components to be matching and original to the car making this one of the most original Bugattis in existence. Before heading out on the 150-mile journey, both Charlie and I were both very concerned with having to keep up with modern traffic in such an old car. We were confident the car could do 50-60mph without too much stress on the engine but we were less happy with the idea of stopping for roundabouts and junctions and pulling away from traffic lights with a difficult, close-gated gearbox with no synchromesh to smooth out our clumsy shifts. The gearbox in a pre-war car is by far the most important thing to master. It is the single most difficult aspect of driving a vintage car and is the most likely thing to break from driver error or inexperience. However, after only a couple of miles we grew more confident with the gearbox and learn the rhythm of the engine, becoming accustomed to matching the road-speed with the engine note. I’m told the Type 40 requires a little more precision in gear-change timing, particularly going from 3rd to 2nd but once you realise that you can’t hurry a pre-war car and relax into the changes, soon the experience becomes much more enjoyable and satisfying when you feel the cogs engage seamlessly. After about an hour into the journey we arrived in historic Henley-on-Thames. The idyllic setting seemed appropriate for our vintage Bugatti, attracting lots of admiring looks from the early morning eights and pairs on the river. Another hour or so later we trundled in to Brooklands to experience our first VSCC event and we were waved into a prime position outside the gates to the famous clubhouse. The variety of cars attending was great to see, but in truth both of us felt a little lost amongst all the different models; lots of the names were familiar but our pre-war knowledge is lacking. The best thing about the event, however, was undoubtedly the sense of community sharing the passion for this niche of car culture that were experiencing for the first time. The cars there were far from garage queens, all having been heavily worked on and baring the battle scars of previous competitive events. The return journey went just as smoothly, with the car proving to be just as comfortable in the passenger seat. After passing Didcot a famous “Golden Arches” glowed in the distance, and the photo opportunity was too good to miss. After refuelling ourselves with some fast food goodness, we continued our drive home in the dusky gloom, the Bugatti’s headlights projecting surprisingly far into the distance. The chance to spend a weekend in such a special car was a real privilege and has certainly peaked both our interest in the world of pre-war cars. These motor cars are so diverse in terms of design both mechanically and aesthetically that it can sometimes feel overwhelming to an outsider but the best and only way to learn about this segment of automotive culture is to get involved and meet people at these events. If you can, take a pre-war Bugatti to Prescott, Brooklands, Goodwood or Shesley Walsh, but if that’s not possible, go along anyway to soak in the atmosphere – you won’t be disappointed. Excited by the prospect of Pre-War motoring? A wide variety of vintage cars are regularly offered for sale in our showrooms. Why not pay us a visit to see how easy pre-war cars can be?